Volkswagen Group of America, Inc. (Volkswagen) is recalling certain model year 2017 Audi Q7 vehicles manufactured August 30, 2015, to July 10, 2016. In the affected vehicles, the third row seat back may move forward under load, such as in a frontal collision. As such, the vehicles do not conform to Federal Motor Vehicle Safety Standard (FMVSS) number 207, "Seating Systems." Travis was great to work with. From start to finish made the process easy for purchasing my new A3. He has been great about checking in with me since my purchase. I love my new car and will be a loyal Audi Nashua customer going forward. My wife and I have owned primarily BMW products for the last 25 years until my wife leased a VW Tiguan three years ago. 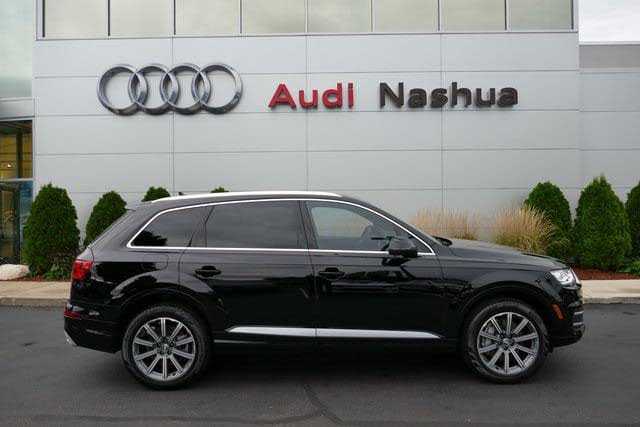 I drove it from time to time and was impressed so when it was time to replace a 2012 X5 I looked at the redesigned Q7. The ride, handling, and performance is as good or better than the X5 and the fit and finish is far superior. It has a little more room inside while not seeming to be larger on the outside. The ride is a little less harsh and more quiet than the X5. Handling install responsive and the turning radius is excellent. It is a joy to drive. It is also easier to fit multiple sets of golf clubs horizontally in the cargo area. I have had the car for about a month and so far no problems. Everything works well. The 2017 redesign is a great improvement over the previous model. Can't say enough good things about this vehicle. I am glad I made right choice. I was looking a car for couple months. I compared SUVs from Volvo, Benz, BMW, Porsche and Lexus. Audi Q7 is the best one. Car is super easy to drive. Super quiet too. Any size concerns related to parking go away with the visual package and the 360 view. As I am breaking in the engine I have not pushed any pedal to the limit but I can sense the power that this engine can provide and I am confident that I will be as impressed as I was with the demo car. Materials and ergonomics are top notch. I recommend to get the visual package because you get the LED lights, the extra cameras and the virtual cockpit which I have found very useful. I also got the Bose 3D sound system. If you are thinking on buying this car, you must listen to the standard sound system and compare. For me it was money well spent. On the negatives, I do not think that you will be able to get more mileage than what they advertised, I have been very reasonable as I am breaking in the engine and I am not getting more than 20mpg combined. The other thing is that sometimes I have to reestablish the Bluetooth connection in the phone to make it work. I have not found the pattern that causes that yet, hopefully the Audi guys tell me if I am doing something wrong next time I go there. Overall, a great experience so far. It is not cheap but you may not have a better option if you want to have a luxury 3-row SUV that performs and looks good for a family guy. I have a brand new 2017 Q7. It is leaking water onto the passenger front side floor each time it rains and every time I go to a car wash! $66k automobile that leaks with less than 2,000 miles on it! I have another service appointment Tuesday. If they cannot repair it I am going to file a lemon law complaint. The navigation system in the new Q7 is a throwback to 2006. There is no touch screen ability. It is turn knob and enter or use the voice command that is almost worthless. It simply does not seem to be able to correctly understand English. Perhaps I should speak German? This car is touted as a luxury vehicle, but it is no where near as nice at the 2011 Lincoln MKT I traded in for it. Absolutely love the car. I've only had it since October 9th, but it has a great feeling of quality and solidity. The interior is well made and of high quality components. Seats are good, but I would expect sears that have upper seat back movement like in BMW's comfort seats. Without that the headrest seems too high or too low. Coming from a 2015 BMW X5, I am left missing the transmission calibration of the BMW, even though they have the same trans. It's quick to upshift and makes me have to kick down when I think I shouldn't. Also, because Audi doesn't make enough of the Q7's, they are in demand and the dealers use that to their benefit. (Pretty much plan on no incentives and no discount on price) Overall I'm very happy with my purchase, and would do it again. If you are interested in this vehicle you likely have read the many terrific reviews from Motorweek, Car and Driver, and even Consumer Reports. I certainly did. I was able to get the vehicle at a small discount which was lucky as some dealers are now asking above sticker or loading on even more packs. The car is a joy to drive and while some have compared the "Virtual Cockpit" to a video game, I find it helpful and very effective at communicating information, which is what a dash should do. The placement of controls is excellent, and they are well organized by function. The volume control for all uses (voice, phone, audio) is delightfully located on the console where one's hand naturally falls. The shifter takes a while to get used to, but Audi seems to have anticipated a learning curve. When I first owned it I tried to put it in reverse without stepping on the brake pedal. The dash lit up to inform me I needed to do so. There are a few issues. First, interior storage for the driver is simply unavailable. The console holds virtually nothing and there is not even a sunglass holder. The absences of cubbies is a disappointment, but certainly not a deal breaker. I have had two minor problems. First, one day the alarm system went off every time I tried to lock the vehicle. The dealer (only a mile away, happily) was able to remedy this in less than an hour. Second, the steering wheel is no longer centered after only 2,500 miles. That, too, will be corrected by the dealer. Overall, it's a terrific vehicle as far as I am concerned, despite minor issues. I've switched from Mercedes. Handling is nicer, not as nice as BMW though. Cabin is very quiet. First impression is amazing. Nicely designed and finished. As soon as you start driving it you realize run flat tires destroy the comfort you may like from Mercedes. Head up display, as Paul already mentioned, produces ugly glares on a windscreen, right in front of you, distracting and destroying the whole experience of having a head up display technology. The best you can do when the glare comes up is to use a paper towel or something else to cover it up. Turning it off doesn't help as glare is a reflection from the HUD optics, not an image from the projector. Driver assistance package seems like an interesting enhancement but the car doesn't fully stop itself as advertised. You better read about all the limitations etc. The last one and a very annoying issue it the air-conditioning. The level of the noise the funs produce on a sunny days is hard to bear. If I had the money in my pocket again I would seriously consider other vehicles like GLS or XC90. Perhaps this is what I'm going to do. Wait for the new GLS and trade it in. Good luck. I love my Q7, but I'm having problems already and have only owned it since the end of June. The hatch has a tendency to not to want to open and it makes a screeching noise when it does open. You have to try and pull it up enough to shut it so you can try and open it again. I've had it in for a fix and all they did was a master reset. What good is that really going to do?? Ha, nothing, as it is happening again. I'm pretty sure the pre sense is not working. I've had a couple close calls where it should have and it didn't work. But they tell me it is. I've just started having issues with the key remembering my settings. I have had to push the button several times now to get it where I have it set for me. I'm wondering if I made a mistake buying this Audi. :( I got rid of my explorer because I was constantly bringing it in for the same problems they couldn't seem to get fixed right. I don't want to have to be doing that again! Head up display optics produce glares which at times can be very distracting. They can be small i.e. two bright points or it can appear as two bright lines, or (pretty bad) large and very bright, and rather large (size of a credit card) spot. If you live in California or any other place with plenty of sun, test drive the car in the middle of the day and make sure you can live with this issue. This alone can be a road block. Side mirrors produce a high pitch noise. Turn off the radio while test driving and listen carefully to the mirrors. In windy days it can be very obvious and annoying. Driver assistance system is far worse than the one you can find on a brand new Volvo XC 90. It is confirmed by IIHS. Test drive both cars and you will see what I mean. 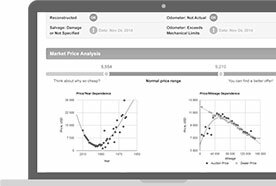 Major concerns on quality of the materials used. This may not be a perfect option for demanding person paying attention to details. I just bought the 2017 Q7. It's disturbing that the skimped on some of the features found on lesser vehicles. Here's my bucket list of the features that this car should have came with: 1. Remote start from key fob. 2. Convex overhead mirror (to watch the kiddos in the back) 3. Wireless charging the cockpit (they missed it, even with all the technology), vents in the 3rd row (this is standard on all 3rd row vehicles. this is a huge mistake.) 4. Driver's key pad for vehicle entry (Ford may be the only company doing this). 5. Sunglass holder (pretty simple option). 6. Basic Tire Pressure monitoring system (they have some formula with the sensors to tell you if the tire pressure changes. Just use a standard TPMS valve). I'm happy with the car, but at this price point the car should have these basic features. I would also have to agree with the comment about the run flats. Run flats are a huge disadvantage all around. I haven't got into the maintenance phase yet, but I'll update my post at that time. The navigation system is poor and confusing. You have to manually change state location even if have driven there. The electronic handbrake can be activated while car is in gear - very dangerous. Map/ Navigation systems poorly described. Manual describes all options, not what is available in that vehicle - very confusing. The new Audi Q7 is more nimbler and more comfortable than its predecessor. Once in the vehicle it is hard not to take it out for a long drive. I am hoping Audi has invested in good parts and produce better reliability. This is the first Audi we've owed and love it! We’ve been loyal fans of Mercedes and Range Rovers over the past few years and were looking for a 7 passenger vehicle as our kids are in various sporting activities. We are only a month in and really impressed with the gas mileage. Spacious vehicle, comfortable ride and handles the road well. I will admit I do like the body style of the older versions as I like to sit up a little higher similar to an SUV, but so far, no other complaints. This car is a huge improvement from my previous 2014 Q7. Drives like a car, loaded with technology, and has a great interior with high quality finish. A little pricey, but so far very happy with the purchase. I have to say that the 2017 Q7 premium plus is a great ride. I am really impressed with the virtual cockpit integration. It was a great buy. I replaced a 2011 Q7 S-Line with 100,000 miles with the new 2017. I had some apprehension buying another Q7 mainly due to the user face to the navigation/entertainment (MMI) system along with the very poor keyless entry system on my 2011. The 2011 was frustrating on a good day, basically a great car destroyed by bad programming but the engine/transmission combination was awesome. So I test drove the 2017 with my list of frustrations and likes from my 2011 vehicle and was very happy to see that most all of my concerns had been fixed or greatly improved upon in the 2017. So I factory ordered another Q7, with everything but the driver assistance package and the Bang & Olufsen sound system. I drive 120+ miles everyday so I am very focused on driver comfort, safety features and ease of use on all features. This car excels in all areas. It is extremely quiet and there is no road noise from the tires. Engine responsiveness is still exceptional. Gas mileage is surprisingly good as I am averaging around 25MPG and I have hit 28+MPG on a few tanks of highway driving. I liked the 2011 as it got about 20MPG and combined with the 26 gallon fuel tank it had great range. The range has improved on the 2017 by 50-70 miles despite the smaller (22.5 gallon) fuel tank. User interface to the entertainment/navigation system is much easier and more configurable and does not require you to take your eyes of the road to find the correct button. The heads up indication of speed, cruise control speed setting and navigational turns is excellent, not sure I can ever do without this in the future! Also, the ability to utilize the map on the driver's dash display is very nice to have. Keyless entry actually works, the old system had so many time delays built into it for some unknown "personal safety" logic that it was basically useless and typically resulted in me cussing out some unknown Audi programming or product management team somewhere unknown.... Seating comfort with the luxury package is excellent and highly configurable. So far my only three complaints or observations are: 1.) On the navigation system display on the 3.0 mile scaling screen it displays random temperature numbers and the cloudy/rainy symbol in 1-4 locations across the map. Does not seem to happen at any other scaling setting. 2.) The tilt steering does not go down close enough to my legs for my own personal taste, seems to stop in too high (straight) of a setting. 3.) On an overcast or partially sunny day it seems like the auto fan setting wants to stay in too high of a setting and basically makes you feel cold and also creates more noise than necessary. Overall the vehicle is excellent and I enjoy my daily drive. We spent month looking at, researching, and reading about the 2017 Q7. This car has exceeded our expectations in all categories. Beautiful to look at, easy to drive, and comfortable for all passengers. 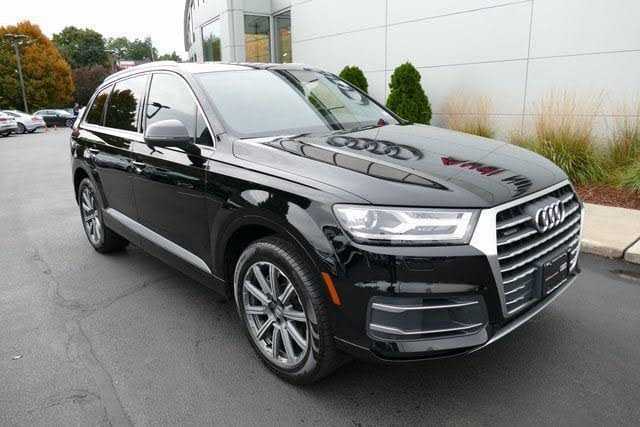 The Q7 is roomy enough for trips to the big box store, while feeling like a comfy sports car. My Porsche driving husband is impressed by the handling at highway speeds and in parking lots. The rear seats provided more than ample leg room for two 6'+ passengers. I love all the creature comforts and goodies: get the Premium Plus! OMG! The 2017 Audi Q7 Is it a dream ? Run Flats??? WTF did you ruin a fantastic car?? I was considering it, and it was my top choice until I found out they only come with Run Flats. After my experience with Run Flats on a Toyota, I will NEVER AGAIN own a car on Run Flats. They ride poorly, have no milage warranty, last half as long as other tires, and are EXPENSIVE to replace. Sorry Audi, I LOVE My A5 Cabrio, but will now buy someone else's car just because of the Run Flats. a very nice car, perhaps a little overwhelming in the technology it offers. Drives well, smooth low speed manners, very nice handling (within the limits of a short test drive). Feels like a hell of a lot of vehicle, though I would be somewhat concerned about maintenance costs when out of warranty - there's a hell of a lot of mechanical and electrical equipment in the car. I spent a ton of time researching and comparing the Q7 with the 2016 BMW X5 and the Volvo XC90. I traded in my 2014 MDX. This thing is light years ahead of the MDX in refinement and build quality. It drives like a sports car. As quiet as a Range Rover. Car & Driver made 0 to 60 mph in 5.5 seconds. Not bad for a 5,000 pound suv. The dash layout is sheer perfection. Real buttons to engage functions with a quality feel. The silly Senus system in the Volvo and my antiquated MDX required at least 2 button presses of the touch screens just to get to a setting. Ridiculous. This thing is so quiet, even when in dynamic mode. I sprung for the air suspension and 4 wheel steering option. It makes a very noticeable difference. The TFT gauge cluster displays Google maps in full glory and is highly configurable to show all information. The heads up display is a huge bonus. The safety and technology features are abundant and although some are intuitive, I recommend an evening of reading the owner's manual from cover to cover. The MMI system works flawlessly for navigation, maps, telephone, audio and all of the cool Audi Connect services. This new Q7 is like a spaceship. Best car I ever bought by far. Driving this car after driving the MDX and X5 is night and day. The XC90 was a nice demo, but it just wasn't up to the level of performance that the Q7 has. XC-90 is a bit more luxurious with really nice front seats, but the 4 cylinder was loud when accelerating and idling was rough. In the Q7 you can't even hear it when stopped. But when I get on it for a strong burst of acceleration , it sings a pretty song. Just an incredible automobile. I love this SUV! Overall it's a nice car, Drivers seat is comfortable, so as second row, however the third row is more like a jump seat for 5-8 year old. AUDI is happy to a nonce about shaving over 350 pounds, well it comes with crappy third row NO leg room, and NO head room !? There's no other option then run flat tires!? 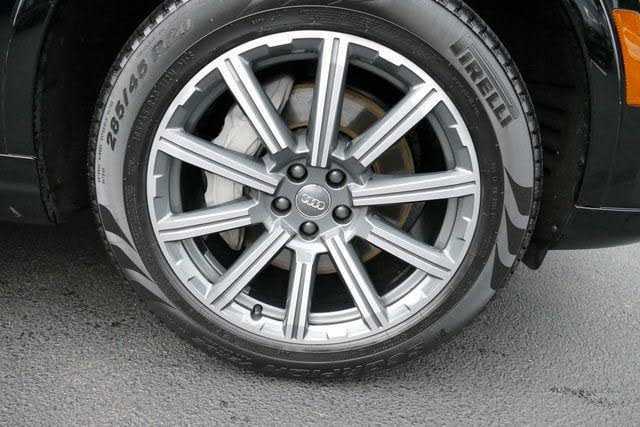 which ONLY available with one of THE WORSE in the market GoodYear tires, so you'll be luck to get 18K miles on it! Road noise and handling, again - crappy GoodYear tires, no improvement on gas mileage, DO NOT be fool of that streaker 19/25 mpg, you're still getting about 16/22 mpg, and about 19 mpg in the suburbs, again it could be the GoodYear's run-flat's which are terrible, a specialty in the ice or snow conditions, do your self a favor and stay home. We have had the car for a couple weeks - Orca Black/Black Interior/Prestige Trim. I spent quite some time with the X5, Volvo XC90, MB GLE, Acura MDX, etc. and this car hands down performed better in my opinion. The interior is stunning though the exterior is a bit tame. Although it is still very early, we haven't had any problems and the service at our Audi dealership has been fantastic. This car is a replacement to a Q5 TDI we have had for a few years, also zero issues. No sooner than I pull out of dealer lot, a warning light goes off... The next day another one, then the third day the first light goes out by itself, but I get another, then the transmission got stuck in park at school drop off line with lots of angry parents behind me, windshield wipers went to and stayed in service position, I got out and pushed them back down. They were inoperable until about the fourth time I restarted the car. That seems to be the trend, I get different warnings for things that are not an issue, low windshield washer fluid that is full, low tire pressure, etc.... It's like rebooting your computer, I have found that after a series of restarts, the glitches end up clearing..... Price paid? Too much for this much headache..... The car is comfortable but after 8 days of ownership, Im not happy at all, give me my 2012 Q7 back.......anyone in the market for a lightly used Q7??? I would not buy again. Best Q7 - Audi took their time and did it right! 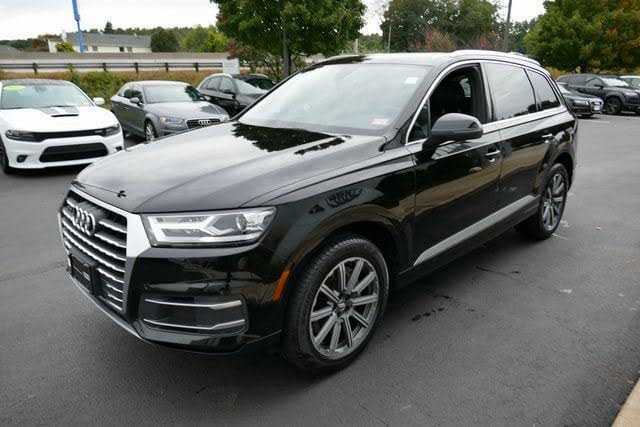 I recently purchased new 2017 Audi Q7 Prestige. I went with the prestige package since it includes cold weather, warm weather, 20" wheels, and the vision packages for a better overall value. 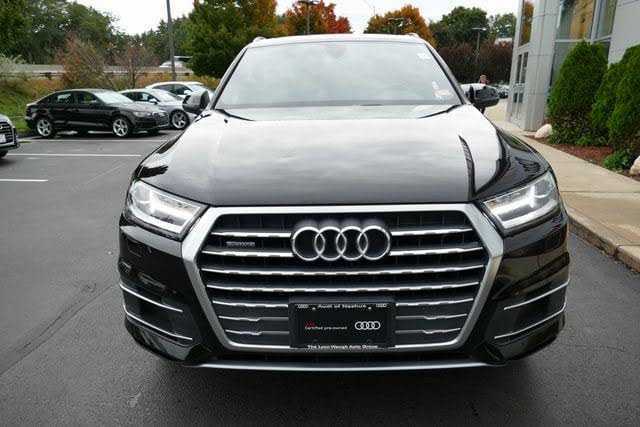 As a previous owner of a 2013 Audi Q7 I was immediately impressed with the way the 2017 model feels in regards to handling, steering feel, and performance. The 2017 model has shaved off 500+ lbs from the previous platform and makes the Q7 feel more like a car. The 3 Liter engine has plenty of power (333hp), smooth shifts from the 8-spd transmission, and great road grip with little body roll. I would describe the 2017 Q7 as nimble, something I could never say about the previous Q7 model - which felt more like a tank. I look forward to driving the Q7 everyday, and right now im looking for excuses to go take it out just so I can drive it. Audi took a long time to re-design the Q7, but I think they got everything right: style, performance, comfort, and technology.